Atopic dermatitis or eczema is a form of chronic inflammation of skin that affects 10 percent of infants and 3 percent of adults. In general, the term eczema refers to a range of persistent skin conditions including dryness, crusting, flaking, itching, skin edema, and recurring skin rashes. This skin condition affects both children and adults. Usually the children completely recover from this irritating skin condition over time but about 50 to 60 percent can face flare-ups even in their adulthood. The cause of eczema is unknown thus far, but it is presumed that a combination of genetic and environmental factors are responsible for repeated skin inflammations. It is also believed that poor hygiene does not cause eczema. Most people with eczema also suffer from various skin allergies, but unlike all other skin infections, eczema does not spread epidemically, nor does it infect other people. Continue reading to know the symptoms of eczema and diagnose this skin disease at home. Itching is the most common symptom of eczema and it often occurs before any rash appears on the skin. Notice any increased itching on your body, especially on hands, feet, knees, and elbows. In some cases the face can also become afflicted. 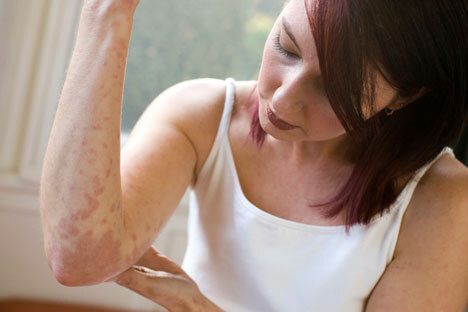 Eczema can be identified from the rash in the itchy area and it often changes the colour of the affected area. People with dark skin may notice the area to have become lighter or darker, while those with fair skin may see the reddish rash changing brown. Furthermore, in eczema, the skin under the rash becomes dry, flaky and thick. If left untreated for some time, the rash worsens into blisters that will seep crust over, which is the most common eczema symptom. Google the photographs of eczema patients and compare your skin condition with their rashes and blisters. This genetic skin condition often accompanies allergies and/or asthma, so search for a history of these conditions in the family. Eczema is a recurring condition that can be triggered by various factors. Hence, it is very important to notice the factors that predispose you to another outbreak, such as reaching a body temperature that is too hot or too cold, exposure to pet dander, using a new soap or detergent etc. Cold or chest congestion and stress can also trigger eczema. While these are all symptoms of eczema, it is always recommended to consult a classified skin specialist for an official diagnosis. Besides diagnosing the disease, the dermatologist will also suggest you a treatment plan.